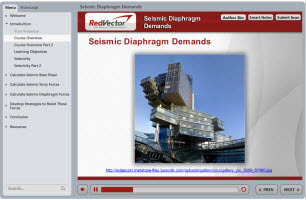 RedVector is excited to announce the launch of a brand new mobile-ready eLearning course on Seismic Diaphragm Demands! This course covers the development of the seismic diaphragm forces based on the IBC 2012 and ASCE 7-10 using ASCE 7-10 Section 12.10. The demand on a diaphragm during a seismic event is not well understood. Using the Equivalent Lateral Force, this course will review the forces on the diaphragms and compare them to the story forces. illustrate how to develop the demand on the diaphragm to achieve public safety; calculate the story force in regard to life-safety concerns, compare and contrast these two forces; develop strategies to resist those forces in a constructible, safe, and cost-effective manner.